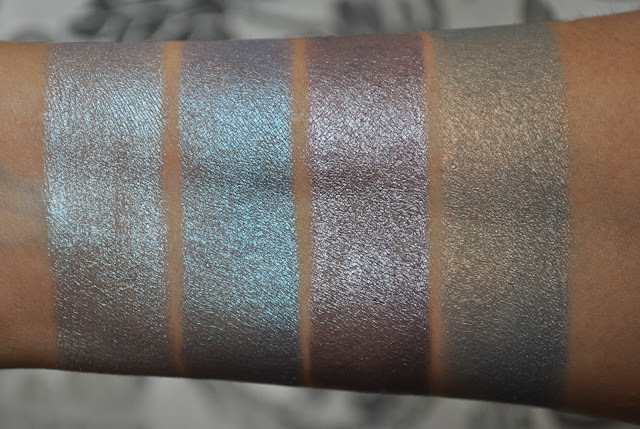 So Lonely in Gorgeous: The Girl With The Color Tattoos...Maybelline Color Tattoo Summer 2013 swatches! 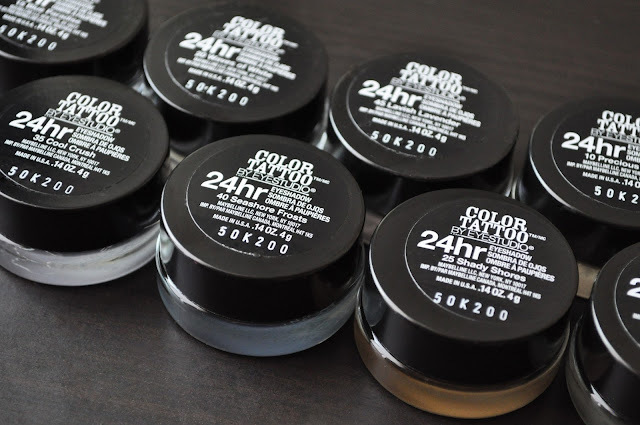 The Girl With The Color Tattoos...Maybelline Color Tattoo Summer 2013 swatches! To my dismay this morning, last month's gloomy weather has carried over into July. I have loads of products to swatch, and horrible natural lighting to photograph them in. However, the show must go on...so, I apologize for any and all overcast photos. 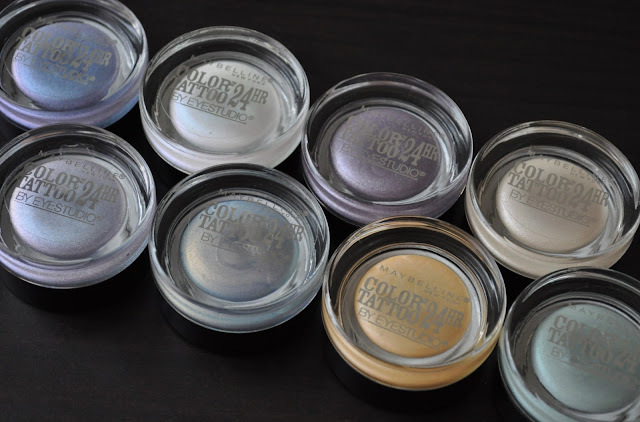 Include in my recent parcel was the maybelline limited edition Summer 2013 Color Tattoos. From left to right:Precious Pearl, Waves of White, Icy Mint, Shady Shores. Precious Pearl: Ivory with pink and silver shimmers. Waves of White: a translucent off-white with an aqua duochrome. Icy Mint: a frosty, sheer, pale mint green. Shady Shores: a translucent muted-yellow with a spring green duochrome. From left to right: Cool Crush, Blue Paradise, Lavish Lavender, Seashore Frosts. 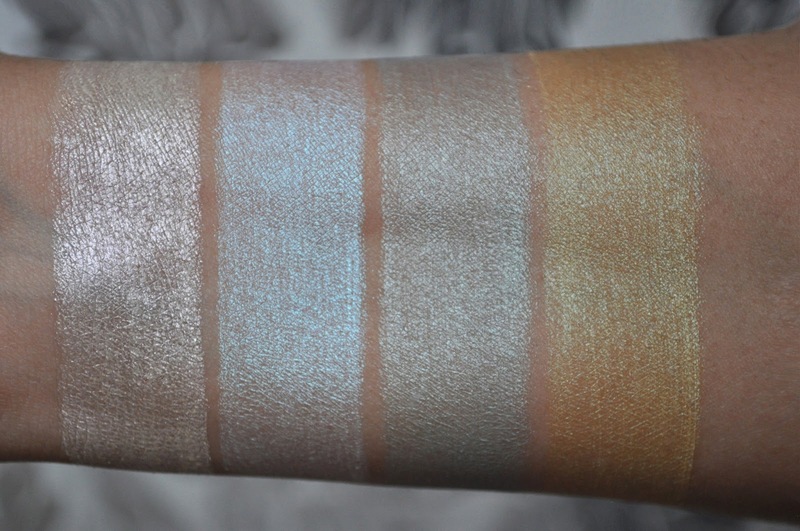 Cool Crush: a frosted baby blue with a grey base and silver shimmers. Blue Paradise: a frosted, medium blue with a silvered-pinkish-lavender duochrome. Lavish Lavender: a frosted, grey-based muted lavender with a silvered-pinkish-mauve duochrome. Seashore Frosts: a frosted, muted, slate blue with a bronzy, peachy-pink, gold duochrome. The new color tattoos have a creamier and thinner, texture than their older siblings. Also, most of these shadows offer a sheer wash of color, which may annoy some. But, with the hot and humid Summer weather, I don't mind some skin peeking through. So far, my favorite shades are Waves of White, Shady Shores, Blue Paradise, and (the star of the entire collection, in my opinion), Seashore Frosts. You really know your films!! And that's why I love you (^3^) You always get it. I think that one should blog about what one is passionate about and you certainly appear to have a HUGE film knowledge. I say DO it!! Perhaps you could pendle between two blogs? Sorry these didn't work out for you sweets. What's going on lately? I would die for Blue paradise and Waves of white! They aren't sold here so I may have to order them somehow!